A few days ago, Beloved and I had dinner at Size Matters. Since this was basically a newly-opened burger joint at our turf, there was little reason not to try it out. However, we really didn’t know what to expect aside from burgers. After climbing a couple of flights of stairs, we find out that they actually specialize in sausages. The fact that it’s a burger joint is still partly true, though. This was indeed a sausage place, and they specialize in sausage burgers. While they also serve classic sausage sandwiches, since we went here for the burgers, we ordered those from their small selection of three specialty ones. I had their 1⁄2 Pound Breakfast In Bed (B.I.B.) 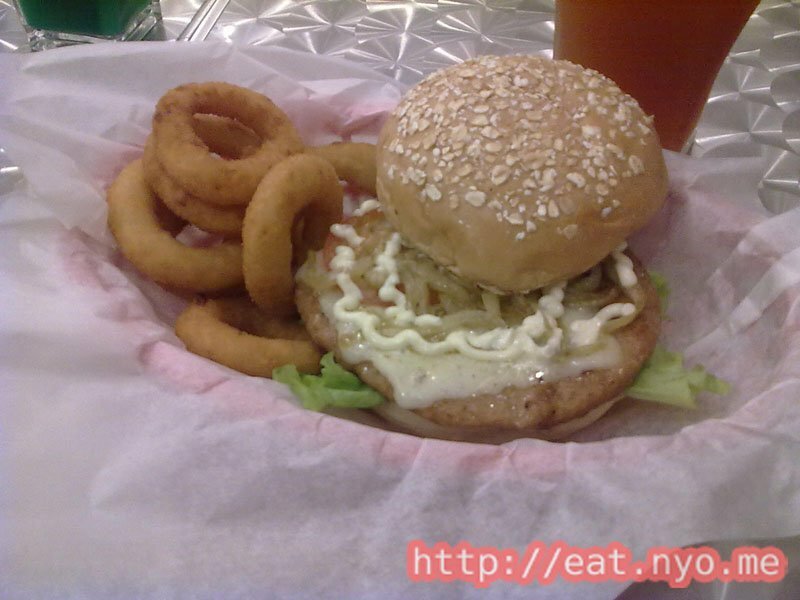 for 245 Php, and Beloved had their 1⁄4 Pound Italian Burger Job (I.B.J.) for 175 Php. Since they had meal upgrades, I had mine upgraded to have curly fries and drinks for 75 Php, and an additional 15 Php for large drinks. Beloved upgraded hers to have onion rings and drinks for 95 Php, and also paid for the 15 Php large drink upgrade. My Breakfast In Bed was indeed a sandwich fit for breakfast. 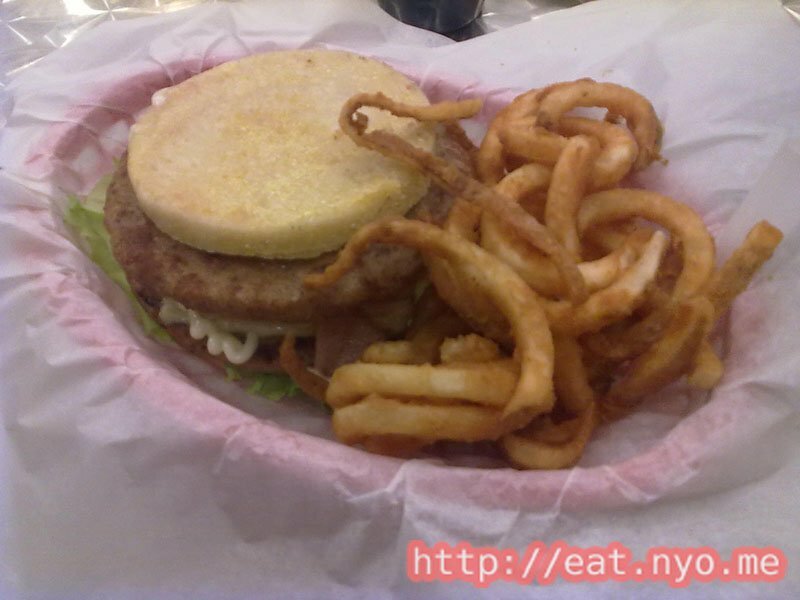 It had two huge 1⁄4 pound sausage patties, egg, bacon, lettuce, and tomatoes in between two English muffins. The taste reminded me pretty much of the delicious Sausage McMuffins from McDonalds, except much more filling. The fries, while good, didn’t satisfy me as much, mostly because of a quantity issue. Beloved’s Italian Burger Job had an Italian sausage patty, plus cheese and lettuce, aside from the mayonnaise that both burgers had plenty of. Her bun is a sesame seed one, so it wasn’t as hefty as mine, but it was pretty big and soft. As for the taste, well, it’s pretty similar to mine, except for a very mild hint of spiciness. Their onion rings receive similar comments to my fries: good but lacking in quantity. Overall, this new place shows promise. Their food is good, albeit a bit overpriced. The namesake tagline is indeed reflected on their burgers. Since the other tables ordered their sausage sandwiches, I can say this applies to those as well. And since I know no other place that specializes in sausage and sausage burgers, this indeed fills a niche even in a variety-filled street like Tomas Morato. I do have a couple of things to frown on: one is the price and size of their sides, and two is the lack of variety in the store itself. They only have three kinds of sausages, making for three kinds of burgers, sandwiches, and specialty burgers. If they manage to spice it up by adding a bit more variety, then there will be plenty of reason to go back to Size Matters. Not recommended for: Sausage haters. Smart nomnomnom tip: They apparently have monthly promos: right now it’s buy four take one free.